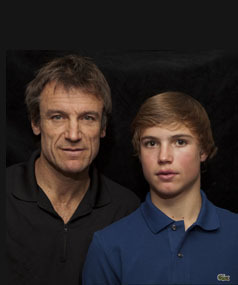 Wilander On Wheels is happy to announce the launch of the MW Foundation. SAVE IT SEND IT SHARE IT are the ideals that the MW foundation stands for… not only while on a tennis court… but for every day life. Email the MW Foundation. The MW Foundation’s main purpose is to help raise awareness for the genetic disease Epidermal Bulluyosa, commonly referred to as EB. EB is a rare genetic connective tissue disorder. There are many genetic and symptomatic variations of EB, but all share the prominent symptom of extremely fragile skin that blisters and tears from minor friction or trauma. Internal organs and bodily systems can also be seriously affected by the disease. EB is always painful, is often pervasive and debilitating, and is in some cases lethal before the age of 30. EB affects 1 out of every 20,000 live births and those born with it are often called ‘Butterfly Children’ because as the analogy goes, their skin is as fragile as the wings of a butterfly. There is no treatment or cure. Daily wound care, pain management and protective bandaging are the only options available. Mats’ son Erik inherited a mild form of this genetic disease at birth. The Wilander’s moved to Sun Valley nearly 2 decades ago to help Erik cope with his disorder. Because of Sun Valley’s elevation and lack of humidity, Erik’s skin does not drastically blister. This allows Erik the opportunity to participate in sports and lead a relatively normal life. However, those who have the most severe cases of EB cannot treat their condition with a change of environment. In an effort to help raise awareness for this organization, WOW is happy to announce the conception of the MW foundation. The MW foundation hosted its first event at WestSide Tennis Club in Flushing NY in August of 2013 during the US Open. 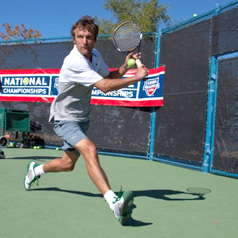 More than 100 attendees played with past and current pros such as Mats himself, Jonas Bjorkman, Thomas Johansson, Karel Novacek, David Graham and Cameron Lickle. This will be an annual event and if interested in attending next years event please contact us at mwfoundation@wilanderonwheels.com. SAVE IT WOW’s motto while on a court practicing. We at WOW believe that you must save every ball hit in your direction. Learn from unorthodox shots and positions. Don’t ever let a moment pass on a court where your greatest effort has not been given. Do not stop play merely because your opponent has hit an out shot. Push yourself as far as your body will allow . . . and then push some more. SEND IT WOW’s motto while on a tennis court. We at WOW believe you must always take risks but only those that are calculated and with a purpose. When you do this, you send it! By sending it you show confidence in yourself while taking control of your own destiny. If you never send it, you haven’t taken your shot. SHARE IT Never should you not share your unique gifts with the world. If you are able to contribute and be a giver rather than a taker your life serves a beautiful purpose. By sharing and contributing to the happiness of others you fuel your own soul. These mottos are not only for the tennis court but can be parlayed to everyday life. Tennis, through fair play, competition, respect for the game and ones opponent, can help give a person the tools to become a better person, and in the end, that is what life is all about . . . being a good person and contributing to the world. Come hit with us prior to the commencement of matches at the Australian Open, French Open, and US Open, sit in WOW’s box seats and be our guest for the day/days/week… whatever you would like. Mats currently serves as a tv commentator for EUROSPORT at all four Majors where he hosts a daily highlight show of the tournament days activities entitled Game Set Mats. Addiitonally, he hosts his own show entitled Mats Point where Mats provides insights and a behind-the-scenes look at many of the tournaments outside of the Four Majors. He and WOW would like to invite you as our guests.